Japanese Sports car has been popular in the 90's because of their great aero dynamic designs that also performs quite great for the price a real person can reach, as the trend continues to the new millennium the Nissan company has introduce their new sports coupe the Nissan 350Z also known as the Fairlady Z, this sports car is considered to be everyone's ideal sports car, judging by the looks, the power and the performance the Nissan 350Z ranks closest to those European Exotic Cars out there, and why is it Ideal? because the price of this car is still in this world. Nissan 350Z introduced in 2003 comes in a sports coupe only and the roadster version of this car has been available in the year 2004. The Nissan 350Z coupe model has different base version, Enthusiast, Performance, Touring and Track versions, while only the Enthusiast and Touring versions are available for the roadster version. 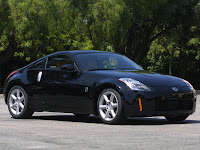 The first models of Nissan 350Z was powered by a 3.5 liter V6 that produces 287 horses and 274 lb-ft of torque, and has a 6 speed manual or an optional 5 speed automatic transmission. Later models of the Nissan 350Z was improved, still powered by a 3.5-liter V6 engine, but was able to produce a 306 horsepower and a 268 lb ft of torque with this modifications made this V6 engine is considered almost perfect as it is easy to rev, quicker response, more power than ever and most of all fuel efficient. while it still comes with the same transmission.